Last month the Friends of Minute Man National Park published the final report on the Parker’s Revenge Archeological Project. I first posted about this project back in 2012 when it was just getting started, then shared periodic updates based on lead archeologist Meg Watters’s public presentations. Technologies utilized in the research informed formal excavations and 1775 battlefield reconstructions. These methods included: 3D laser scanning, GPS feature mapping, and geophysical surveys including metallic surveys, ground penetrating radar, magnetic gradient and conductivity/magnetic susceptibility. Taken together, the technologies enabled researchers to locate a farmhouse that figured prominently in the battle terrain, to recreate the actual 1775 battlefield landscape and battlefield features and even to model exactly what combatants could and could not see at various positions along the battle road. Artifacts discovered included 29 British and colonial musket balls from the battle. The location and spatial patterning of the musket balls recovered enabled archaeologists to interpret the exact positions where individuals were standing during the battle—and then outline battle tactics most likely deployed. For folks who want to read the report, be aware that in P.D.F. form it comprises 35 megabytes of data. My download from the Friends of Minute Man site stopped several times, so I had to keep an eye on it to poke the restart button. The report contains over 300 pages with more than 100 illustrations, most in color. Those illustrations include photographs of artifacts and researchers, maps of the field, and charts. Unfortunately—and this is the biggest shortcoming of the report in P.D.F. form—many of those maps have blurry text and lines, making them hard to interpret. This is a scientific report and a government report (not produced by the government, but for a government agency). As such, it includes a lot of information that’s necessary for future study but may not interest more casual readers. There are a lot of blank pages, a list of every artifact found in the study, and transcripts of discussions among experts assembled a year ago. pages 51-65, on the original verbal sources about the event and how historians have described and interpreted it. 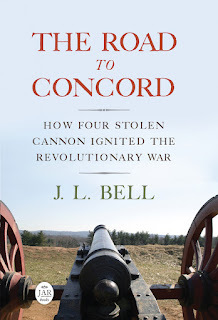 the detailed recreation of the skirmish based on the new evidence, pages 153-197.
for technical details, descriptions of the field work (pages 81-99 and 140-150) and the recreation of land use in 1775 (pages 103-121). This project was a big undertaking. We should be grateful to Watters, the Friends and their donors, Minute Man National Historical Park, and all the enthusiastic volunteers who made it happen.